We woke up to a rainy day, and got going around 830. We called Mount Cook Ski Planes who, not surprisingly, was not flying today. 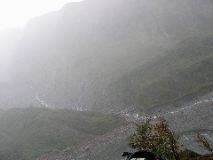 So we decided to drive over to the DOC office in Fox Glacier Village and try to figure out what to do on a rainy day. 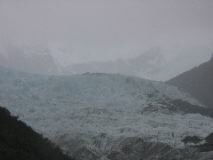 The lady there told us that we could take an hour walk to within 30 meters of the glacier. 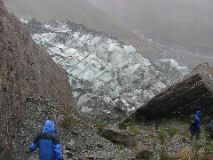 We asked her about the guided glacier walks and she said that’s probably not a bad bet in the rain. 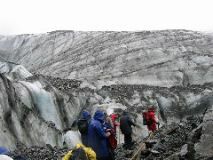 We quickly headed over to Alpine Guides just in time to join their morning half-day glacier walk (actually about 5-10 minutes late, but they waited for us). 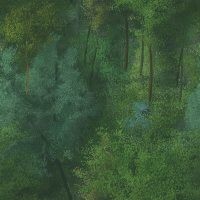 We ran to the car and changed into warmer clothes, put on the boots they supplied and one of their raincoats for Jason and jumped onto a bus full of passengers waiting on us. We felt bad for holding up the show, but were glad that we made it. 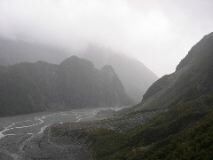 They drove us to the head of the trail that led to the base of the Fox Glacier, and we were both wondering how this was any different than doing it on our own. 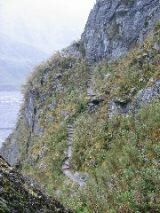 However, about half way up to the glacier, we took an unseen diversion and headed up into the bush over a ridge on a small trail that would not have been easy to spot without the guide. 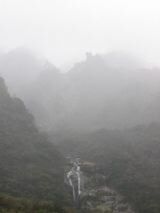 There was a pretty good uphill stretch leading through the rain forest before we reached the ridge, at which point we followed a narrow path over an 80-meter drop-off while holding on to a chain that was bolted to the rock face above. 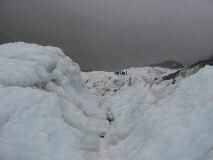 From this point we could see our path out onto the glacier (which was now below us in the valley) and hiring the guided tour was feeling more and more worthwhile. 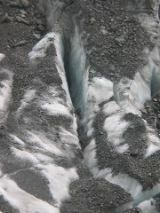 We tramped down to the edge of the glacier, grabbed some walking sticks kept beside the trail by Alpine Guides and headed out onto the glacier. 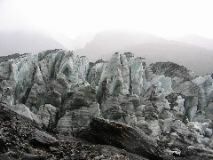 We stopped to put on the crampons that they had provided, and the cold began to set in. 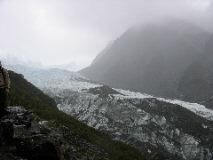 Fox and Franz Josef Glaciers are unique in that they’re two of three glaciers in the world that exist in a temperate rainforest climate. This is actually very bizarre when you think about it, and it really set in as we began to freeze while putting on the crampons. Just 10 minutes earlier we were almost uncomfortably warm, tramping through a rainforest, and now we were sitting on a frozen chunk of compressed snow, freezing our butts off. 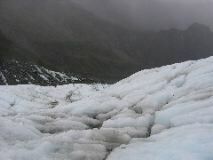 In addition, it was interesting to note that of the 3000+ glaciers in New Zealand, we were on the fourth largest (Franz Josef is the fifth). It was raining the whole time, but it would get heavier and lighter quite frequently. 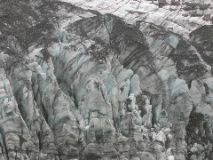 We continued on up the glacier to a portion that didn’t contain as much moraine (chunks of the rocky hillside that had collapsed onto the glacier) and the view of the glacier was better. 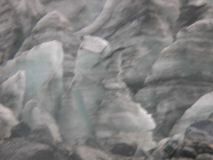 There were several streams running down the face of the glacier, which was kind of a weird sight. 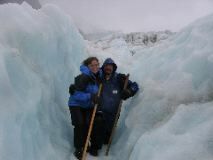 Our ascent on the glacier culminated with a trip through a small crevasse, an excellent photo-op. 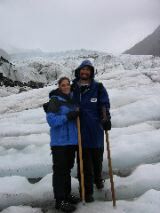 We turned around and headed back down the glacier and we were both glad that we had opted for the half-day, rather than the full-day, tour with the rainy, nasty weather. We were very wet and heading towards cold and miserable, but so far it had been worth it. Probably the most fun you could have on a cold and rainy day. We chatted with the guide for a bit on the way down. Turns out he was a geologist and engineer before dropping the boring life to become a mountaineering guide. He and Lynette enjoyed a good conversation about environmental engineering (specifically fresh water supply and mine tailings remediation). Despite our “waterproof” gear, we arrived at the bus quite wet. The boots they provided were not waterproof at all and we both had a significant pool of water on our feet. Although we were glad that we had brought our good ski gloves, we were even ringing water out of those. We made it back to the building where the trip started, gave back their boots and coat then, and checked out all the café’s in town. We settled on the Cook Saddle Café, which had a nice fire to sit by and a fair amount of “hot foods” to choose from. Lynette asked what kind of sodas they had, which confused the waitress, so Lynette asked for pop. The waitress figured out what she was talking about and listed them off. Lyentte asked what they called it in New Zealand and the waitress replied, “well, I call it post-mix drinks, since that’s what they actually are.” It was very reminiscent of Jason’s conversation about zebra crossing. It seems as though Kiwis are not too tolerant of the fact that people in other parts of the world might have different words for the same thing. We had a nice hot meal consisting of carrot and coriander soup (which was better than it sounds), bbq ribs, fried bbq chicken wings, and hot coco. It was just what we needed to warm up a bit. After lunch, we jumped back into the van and headed north. 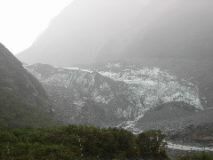 We opted to skip Franz Josef Glacier since it was still clouded over, and we felt that it wouldn’t be too different from the Fox Glacier. The rest of the drive to Hokitika was uneventful. We arrived at about 5pm, just in time for all of the shops to be closed. We spent a while trying to find the National Kiwi Center, which had apparently changed names, locations, and operating hours since our guide book had been written. This made it not only difficult to find, but also closed by the time we found it. EcoWorld, as it’s now called, is not exactly what we thought it was going to be anyway, so we weren’t too disappointed that we missed it. It was a building in the middle of town and all we could see from the outside was a bunch of bird cages. We popped into the grocery store to get a few more supplies before deciding to camp in Hokitika Holiday Park and go to Arthur’s Pass tomorrow. Since it was an early evening, we had time to download all our pictures from the camera and update work on the journal and prepare the web page for the next upload opportunity. Dinner was taco salads and Monteith’s original ale.